(KPL) Some 8,743 out-of-school children in Laos have benefited from the Non-Formal Education Programme over the past three years, a meeting was told on Feb 13. 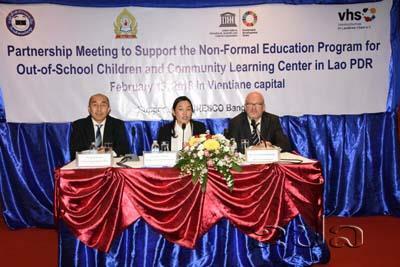 The Partnership Meeting to Support Non-Formal Education Programme was held in Vientiane. The specific objectives of the meeting are to present current learning programme and its achievements and identify opportunities and resources for effective collaboration on providing additional learning opportunities for out-of-school-children and the establishment of Non-Formal Education Centre at district and village levels. Representative of UNESCO Bangkok, Mr Ichiro Miyazawa, Regional Director of DVV International, Mr Uwe Gartenschlaeger and representatives of government and private sectors attended the meeting. “The Ministry of Education and Sports has recognized and very much appreciated the valuable and positive impacts of the traditional and continued support from the UNESCO Bangkok, DVV International in Laos for a shared great effort in achieving Sustainable Development Goal 4: Ensure Inclusive and Equitable Quality Education, and Promote Life Long Learning Opportunities for All,” said Ms Philany Phissamay, Deputy Director of DNFE. “In achieving Sustainable Development Goal on Education (SDG 4): ensuring inclusive and equitable quality education and promote lifelong learning opportunities for all, providing non- formal education is an important strategy and a practical pathway in providing all out-of-school-children, youth and adults with effective learning opportunities,” she added. For several decades, the Department for Non-Formal Education, Ministry of Education and Sports, UNESCO Bangkok and DVV International have been promoting NFE Programme for out-of-school children, unemployed youth and illiterates in remote regions of the Lao PDR with 26 Community Learning Centres established to offer learning opportunities to remote communities. However, there are still more than 380,000 children and youth who have inadequate access to education and millions of adults who need skills and functional literacy in the Lao PDR. Many disadvantaged children still receive inadequate technical and financial supports.